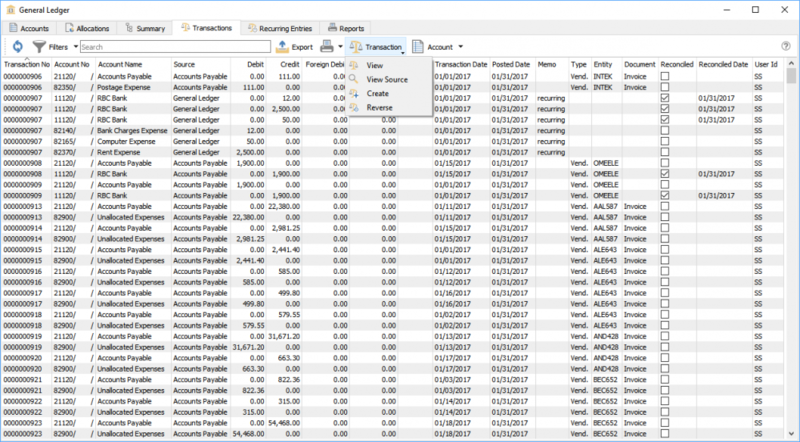 In this screen you can see all transactions posted from last year, this year and next year if items were post dated or you are working in next year. Filters can be set to view less transactions and either reported on or exported. When printing any report with the Crystal Report Template of GL Transaction List will be listed. The search box is very powerful in this list as the user can find any word(s). An example would be to search for a customer code and every transaction posted for that customer will show on the list. Or search for a purchase order number so that every receiving, closed and AP entry will be found. Refresh – Refresh transactions to see if there are transactions posted. Search Box – Enter is a search to look for word(s) in all fields. Transaction Date – The date that the transaction was posted to. Posted Date – The date the user was logged into Spire when they posted the transaction.